Volume Control option to stay open in forefront for ease of use. To control the volume when using my PC as the source device, I first need to open the volume control slide then adjust the volume. I suggestion a setting that allows the volume control slide to stay open in the forefront for ease of use. Seems easy right? Maybe others would like this option. Also, since my toolbar is displayed on the bottom of my screen, attempting to get to the volume control usually ends up displaying my toolbar that I need to scroll away to close, then attempt to get to the volume control again, Having the volume control stay open would also solve this. Thanks! Deezer is a great music source, switch from Tidal. Really am enjoying Deezer so far. Everything is easy to find, it is easy to use and it never crashes. There is just a tiny little thing that I'd like to see implemented. You see, Soundcloud and YouTube do the same, where you have to hover over the speaker icon in order to regulate the volume. 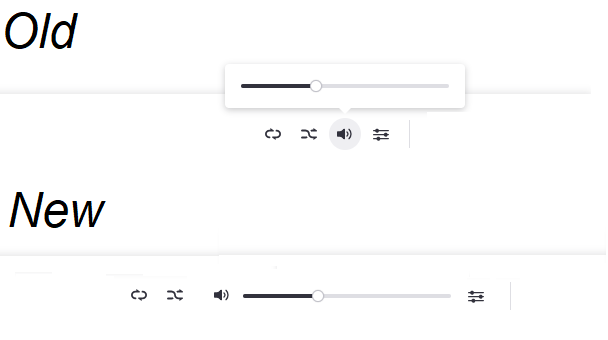 Only Spotify allows the user to immediately adjust the volume, which is not only time saving but more comfortable to use. I can understand why you would like to keep the interface this way. It looks more elegant, so rather than changing it completly I support the idea of giving the users the ability of customizing their interface (just a little bit).